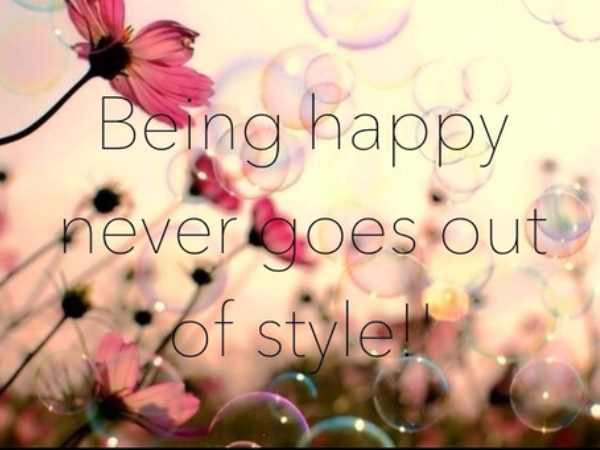 Try these simple tips and you may be happier than ever! There’s no real secret to happiness. It’s all about keeping your expectations realistic and learning to accept that life isn’t perfect. In order to be happy, you need to focus on the opportunities around you, and be grateful for everything you have. Create your own happiness. You’re the only person who can lift yourself up if you feel down. You need to work actively to recognise negative thinking, and to step back and decide if that’s the way you really want to feel. Helpful tip: Stick happy photographs around your room and study space, where you can reminisce on who and what made you happy. We aren’t all the same and thank goodness for that. Imagine how boring life would be if everyone was interested in doing the same thing. Get to know yourself, find out what kind of things you like to do, and do those things. Whether it’s going for a morning run, helping out at the animal shelter or baking cakes, do what makes you happy. Set goals for yourself, and don’t be afraid to dream of the long term. Remember that feelings follow actions. If you’re feeling down in the dumps, try your best to put on a smile. Before you know it, your dreary mood will have lifted and you’ll have brushed that cloud of negativity away. Surrounding yourself with positive people is one simple way to stay happy. The opposite goes for those surrounded by negativity – try to stay away from them. Spend time with people who bring out the best in you and allow you the space to be your authentic self. Remember to let those close to you know how much you appreciate them. We all have bad days, and sometimes these drag on for a bit longer than you’d like. Try to take the bad with a pinch of salt, and remember you’re in charge of your own happiness. If you’re feeling down, change your routine. Go for a walk around the neighbourhood, pick a bunch of flowers for your mom, make a sandwich for a homeless person or tidy your room. You’ll be surprised how helping others will make you feel better about yourself.